As I conclude my first year of blogging it is a good time to reflect on the topics that interested you, my readers, the most. Here is a quick reference guide to your most read posts of 2014. 1. Our New Four-Letter Word: This post focused on how we inappropriately use the simple word ‘busy’. This post even resulted in a twitter email from a reader who pledged to not use the word busy for the year (how is it going Cameron?). 2. What if Everything Rises & Falls on Followership? Coincidentally, this post was written days before my attendance at the International Leadership Association Conference (ILA) in San Diego. Followership was one of the hot topics of the event and I am excited to see leadership being reshaped to embrace the importance, power, responsibility of active followers. 3. Focus: Finding Strategic Clarity. Review three signs that indicate your organization may be suffering from a lack of strategic clarity. I also want to remind you of one of my first, and personal favorite posts, The Tale of the Orange and the Lemon tree. I jogged by this amazing fruit-laden tree this week and was reminded anew of the richness of this metaphor. As we anticipate 2015, I look forward to getting to know and work with many of you in the months ahead. Your comments and suggestions are always welcome. I’ll start with a simple confession – I’ve read far too much on the subject of leadership. While I’m at it, here’s confession number two – I’m jaded by the amount of authors who claim to have figured out the leadership solution. This is well illustrated by The Fable of The Blind Men of the Elephant. In this poem, each man defines an elephant – an animal they have never encountered – based upon the unique body part they can feel. Since each of the men are each touching different parts – the trunk, the leg, the ear, etc. – each provide an accurate description of one component of the elephant. However, a lack of synthesis of their observations results in exaggerated and incomplete viewpoints. Leadership literature often fails on the same premise. While authors and speakers provide valuable insights about leadership, they often promise the whole elephant instead of understanding and embracing the fact that they are defining a part. As a result of my frustration, I began looking for a means of looking at the whole leadership elephant and not just the parts. I sought a framework which would help me sort through the clutter. This pilgrimage was guided by the advice of a former communications professor (thank you Dr. Strom!). He taught me that great communicators use figurative ‘pegs’ to hang their ideas on. When done effectively, these pegs help listeners make sense of the subject matter. When pegs are used effectively, it helps complex subjects seem simple. So I embarked on a journey to understand the pegs on which the various parts of the leadership elephant could belong. WHO is a leader? This focuses on the identity of a leader. WHY do leaders lead? This delves into the motivation of a leader. WHAT do leaders do? These involves the measures & outcomes of a leader. So how is this helpful? Together, WHO, WHY and WHAT envelope almost every concept you read in leadership literature. For example, Jon Kotter’s famous book, Leading Change, primarily focuses on what a leader does. Ten Engstrom’s The Making of a Christian Leader, focuses extensively on who a leader is based on biblical standards. Robert Greenleaf’s model of servant leadership focuses heavily on why a leader leads. While leadership books or speeches often touch more than one category, you will find that authors typically have a predominant focus on one of these three components. This concept is simply illustrated by using something that I call the triadic leadership model (Figure 1). The triadic concept is not my own and is supported by social science research. In short, the core strength of triadic thinking is that is ways to present an integrated whole while also demonstrating the interplay and tension between the individual components. When it is used to define leadership, triadic thinking provides three simple pegs on which to hang leadership ideas. For example, Donald Trump’s television show, The Apprentice,demonstrates strong themes from the WHY corner of the triad. Trumpian leadership focuses on money as the reason that to lead. In contrast, a biography about Mother Theresa will reveal a very different why – to serve others. As the leadership triad has become seared into my leadership worldview, I find myself using this filter to contextualize leadership concepts. If you are speaking of vision, I know you are dealing with the WHAT of leadership. When you focus on desirable leadership traits I understand you are referring to the WHO of leadership. At this point I must state a clear caveat. While the model of triadic leadership has helped me understand leadership in a deeper way, I do not purport it to be the answer to leadership studies. Rather, I hope it will be a means to assist you as you try to make sense of the complex leadership elephant. How does this model help you understand leadership better? 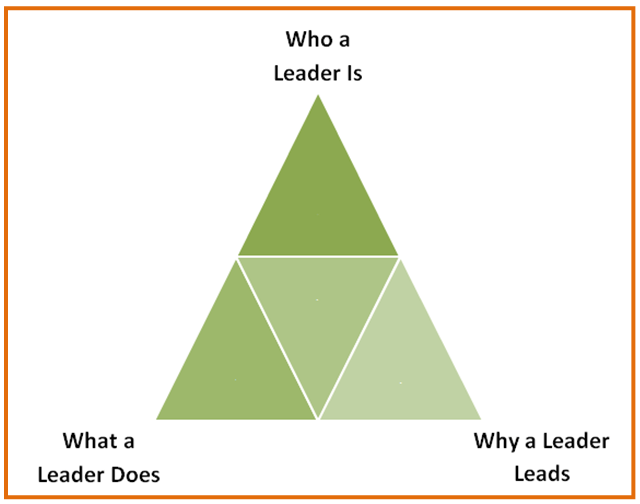 What aspects of leadership do not fit into the triadic leadership model? Which corner of the triad is most prevalent in what you read or hear about leadership? Note: This blog was previously published on the web site of my friend and colleague, Paul Sohn. Why not subscribe to my blog? Click on the ‘subscribe’ button on my blog page! What do the terms Just Do It, Don’t Worry be Happy, Manyana and Hakuna Matata have in common? Each provides a glimpse into a person’s orientation toward the future. Nike’s Just Do It phrase connotes immediacy, importance and the need for self-determination. In contrast, Manyana suggests that we should live in the moment as there is always tomorrow. Individuals and organizations each possess a bias towards one of these two styles. This is called future orientation and it is an ingredient which defines how we operate, individually, nationally and an organizationally. This blog will focus on future orientation and is part 2 of an 8 part series which will help you develop global leadership skills (click here to review the first blog on Performance Orientation). Future Orientation is the degree to which we encourage and reward future oriented behaviors such as planning and delaying gratification. An interesting lesson from this research is that almost every country places a very high value of future orientation. However, the difference between high and low performers is execution – the ability to act on your plan and delay gratification. The study also revealed that being a rich country does not necessarily correlate to having a high future orientation. There are many poorer countries with high future orientation that are not wealthy. Overall, higher levels of future orientation is an ingredient for personal and organizational success. For example, my blog earlier this week (Hello My Name is Agility) demonstrated that the most effective companies have time planning horizons of more than 5 years. Therefore, we typically want to help people increase their future capacity. The ability to identify future orientation helps you work with individuals or organizations more effectively. Here are a few tips on how to use this information as you work with others. Begin with awareness. Is the person/organization you are working with able to self-identify their time orientation? Awareness is the first step! Be positive! Remember that most people/organizations want to have a high future orientation! Stay focused. Help those with low future orientation establish clear future goals. Consistently remind how about these goals and the need to delay gratification in order to achieve them. Keep it personal. Help those with high future orientation maintain healthy social relationships. People matter! In our next installment of Leading Globally, we will discuss how gender affects cultural norms.